Leah's Notions- "What Are You Worth?" Leah's Notions - "Creative Financing"
Leah's Notions - "Don't Fudge the Price"
I Have A Theory - "Money & Change"
I Have A Theory - "Listing Prices"
How to price for mending? I am having a problem with charging for my work. Do you advise that I as the seamstress provide the fabric and charge a rate based on that. Or let the clients provide the fabric and charge that way. What do you think is the best way to handle this. I have a client that is providing a pattern and her fabric for a wedding dress that she wants to change the style to a corset back and add a chapel train. The pattern is an A line with a zipper back and no train. I don't want to over charge but I also don't want to under charge for my services. I do not often take on scratch work. I do mostly alterations. On the rare occasion that I do make a gown, the client must pay for all materials before I start sewing. If they buy the fabric I tell them how much to buy. I never accept a job where the client comes to me with pattern and fabric already bought. I must meet with the client and determine what will be bought before hand. It doesn't matter if I go to the store or they do, they must pay for the fabric. I charge by the hour for my labor and whatever it takes is what they pay. I give then a guess of how many hours it may take. I make sure they understand that this is not an estimate and the actual cost may be much different from my guess. In many states when you give an estimate you are bound to stay within 10% of it for the final cost. When a client makes so many changes in the course of creating a garment that added considerable to my time I find it hard to stay in that 10%. So, I don't give estimates. I just found your website. 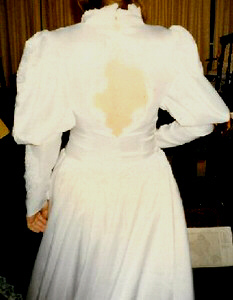 I have been altering bridal dresses for several years now. 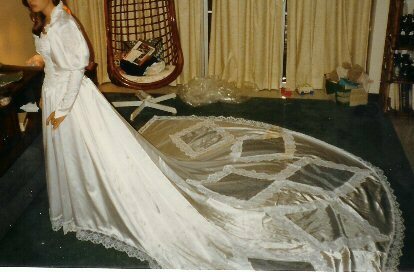 There have been several times that brides have "outgrown" their gowns and needed altering. Seams could not be let out enough so I removed the zippers and created the lace-up closures. It takes somewhere around 4-5 hours to do this. What do you think is a fair price to charge? After reviewing your price page, I realize I have been undercharging by about 66% on everything that I do! The 2 dresses I have pictured with lace-up backs were very different. One was quite easy (about 2 hours of work), while the other drove me nuts. I charged about $80 for each because it was a learning process. The next one that walks in the door will be at least $100, and I'm going to look at the inside of the gown much more closely before I quote a price. I usually gear my pricing on $30 an hour adding on for fussy fabric and complicated construction. This is the high end of typical for the city I am in. Some places couldn't handle that much and some places it would be low. There are many factors in pricing, including the skill level of the sewist. I don't like giving out my prices because the person asking might not have the same experience level of my business and is therefor not worth what I would charge. That said, most ladies who are sewing for profit are not charging anywhere near enough for their skills. Sewing is a skilled profession that needs to be respected just like pluming and carpentry. Those professions charge hourly rates that can make you cry. No matter what level you are at, putting a price on your work is not easy. You want to be fare to your customer and also make a profit for yourself. When it doesn't work out that I make a profit, I chalk it up as a learning experience and move on to price that item better the next time I get one. Again, I have to tell you how grateful I am for your wonderful website!! As a relatively new bridal seamstress, with a small business, I turn to your website so many times for reassurance and advice. It's good to know that other professionals grapple with the same issues. I've been approached by a former co-worker who wanted a wedding gown made in 1950's style, cocktail length with a full skirt and a jacket, from duchess silk, fully lined. The task included finding the right pattern, grading it(which I've done before but it's not my forte, really), and making it plus the muslin and 4 fittings, in about 6 weeks time. It seemed tight since I have other clients. My quote was $1500. She hoped it would not exceed $1000 but I found it very low for this amount of custom work, and in my opinion even $1500 is rather low but I took the P.R. factor into it. I think she was hoping for the "friend's discount" and never called me back. I stand by my quote, but what are your thoughts about the price? Humm, I would not have quoted anything less than $3000. That's really high but they are being very unreasonable in asking for it to be done in 6 weeks. I would ask for 6 months and as many fittings as I need to get it done right. I don't do much custom work because I just refuse to price low or let the customer set the rules. I usually say $30 per hour and give no total estimate. Most folks don't like that. I can make $30 an hour doing alterations and I get plenty of that type of work. I'm not interested in getting less just because someone wants something made from scratch. If you just want to do this type of work you can price things lower and use your joy of sewing as a part of how you get paid, but I really need to make money. I do often do stuff like this as a gift for friends. I do not charge for my time and they buy the fabric, but that's another situation. A gift is a gift and business is business. It's a hard call to make but once you've made it a few times it gets easier. I work in the school system but do alterations on the side. I am in the process of altering a wedding gown and have no idea what to charge. Can you help me? This is what I have done so far: took up the shoulders 3” on each side, changed the neckline from scoop-neck to v-neck, added 21/2” inset in each side seam to expand bodice 5 inches. Hand sewn 23 lace appliqués to front, back, sides and both sleeves. I still have to shorten the hem 4 inches, add 10 yards of lace and bustle the back. Can you give me a fair estimate of what it should cost to do these alterations? I want to be fair, but also want to get paid for my time. Wow, that's a lot of work! I just finished a gown that had almost that much work, minus the insets, and it was almost $400. Do you have any idea how many hours you have in this job? Any seamstress with good skills should be getting at least $20 and hour in my humble opinion. I charge $30 and hour. I seriously doubt I would do this job for less than $600. Did you give her any kind of estimate for this work? No. She didn’t ask. So far about 10 hours. You need to be giving her an idea of what the work has come to so far. If you wait till the end she can give you one horrendous fight about what you are asking and refuse to pay it. She can claim you never told her you were expecting payment too. $200 to $300 for what you have done so far is reasonable. Thank you for the advice. She knew she would have to pay, we just never discussed a price. I really appreciate you taking the time to consult with me. I do alterations all the time, this was just more than I had anticipated. This lady always has very challenging things she wants done. I wasn't looking for this work, but in the last 3 weeks I have been asked by 2 people to sew for them. The first person I do know, as I did some machine embroidery for her, and have know her via other interests for at least 10 years now. She has aske me to make a first communion dress fro her daughter. The second person just "heard " me mention I can sew, and wants me to make a skirt and over blouse for a dance recital in June. I need to know how to charge for this sort of work? Right now, I am figuring the cost of materials + time, and am keeping track of time. I would appreiciate any advice you would be willing to give. I do little scratch work because once a customer finds out what I want to charge they say they can buy it for less and I say, "Go ahead". I charge $30 per hour and I give no hard estimate before work is started. I may guess at how many hours it might take, but I do not write anything down as in a contract. How ever long it takes is how long it takes. If the customer doesn't like that, then I will not be working for them. You do not have to accept a job just because someone offers it. If it does not pay what you wish to earn than you can turn it down. What you ask to be paid is up to you. If you are willing to price your time low to get more work that is for you to choose. I know many seamstress who make less than minimum wage for their sewing time and I just think that is not right. Your talent is worth more than that. Plumbers charge up to $80 per hour. I think sewing talent is worth just as much as plumbing talent. I was searching for an alteration price guide and found your site. I have been doing bridal alterations for about 11 years, I went to college for Fashion Design in Atlanta(which really has nothing to do with alterations but helps) and now I sew for about 3 different bridal stores and also do competition dance wear. I have 2 little girls that I just yelled at, and drive me crazy when school is out! I love to sew! I have sewn since I was 5 and my grandma says earlier but I don't remember. I don't remember learning how to sew, because I guess my mom and grandma sewed for a living. My grandparents had a rag rug mill when I was growing up and I learned to sew them when I was about 7, on a commercial machine. I have worked hard all my young life ( I am turning 31 this July 3rd!). I am constantly told that I look to young to be doing what I am doing. 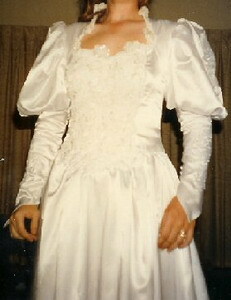 I started working at a bridal shop at the age of 19-a full time seamstress! I love bridal and always have. The prices were already set then and I earned an hourly wage. That was about 12 years ago. The price of everything has gone up since then! After about 10 years the shop closed, and I started sewing at home. I would of never quit there because I loved it so. I started sewing the dance costumes because the owner of the dance studio was getting married and she got my card from them. I love costumes too! I am pretty good at the pricing for them. But I thought about charging by the hour like mechanics do. The main shop I sew for now the owner wants me to keep the same 1995 pricing, but I barely make enough to pay for the time to pin them up. What should I do? I want and need to go up on the prices and I want to keep the customers happy. Every time I tell them what it will cost they always say, "really, I thought it would be more." That's why I think I should raise my prices. A shop in a near by town charged 40$ to take up sides and I would of only charged $15. I think I let the fact that I love what I am doing get in the way of what I should charge. The shop I sew for now had another seamstress that they had to use this prom, and just about everything she did had to be redone. I don't like doing it twice, but if I messed up I will fix it. And she charged more! And people paid it. Customers have told me this is a rare talent that I have, and I don't charge enough for it. I have fixed some mess ups that I don't even understand and then they end up keeping the money they charged for the alterations and then I have to fix it. I think I can make $20 an hour, I live in western NC. Gas here is 2.98 a gallon. Do you think that is a fair rate for hourly service? Thanks for your time and sorry about the book. I have no one here to vent to except my husband and he doesn't understand anything about alterations. When I started sewing for money, pricing things was such a difficult decision. I wanted to be fair with my customers but I also wanted to pay my bills and turn a profit. I was in Greenville, SC at the time and found that I needed to keep my pricing modest. In a few years I moved to Rocky Mount, NC. I could charge a little more there, but it was nothing like what I do here in Cincinnati, Ohio. Being in a large city or a rural area effects this too. I also think that the level of experience a sewing artist has is a big factor. I now have over 25 years of experience and know that I am worth much more now than I was back in Greenville. I gear my pricing on a $30 per hour scale. An item that I think will take me 30 minutes will be charged at about $15. I only count sewing time, not fitting time and some things get premium pricing for the type of fabric or if I have to do extra things like run to the fabric store for something. I do have a price list that I use as a referral for most common jobs like hemming, but most pricing I make up after I see the garment on the customer and evaluate what needs to be done and how long I think it will take me to do it. I usually guess well, but now and then I end up spending much more time than I predicted and cuss at myself for setting the price too low. It sounds to me like you are doing fine. It might be a good idea to set a time once a year when you go over your pricing and give yourself a raise according to how you think you have increased in value from your experience. Don't listen too much to what others say about your pricing. If you are lower than most in your area you do need to adjust to be marketable, but it's more about what you value yourself at then how others value you. Your website is terrific - it's so well written! My email got returned to me when I sent it through the "questions and comments" address so I'm trying your other address and I hope you don't mind. I'm relatively new to the bridal end of alterations, but I've been sewing professionally for years and still have a great problem with the pricing and would appreciate your input as a fellow professional. I'm working on a wedding gown which needed mostly beading and trimming embellishments, and a very minor alteration in the shape of the shoulder strap(it was more about a design choice, not about fit or size). The beading, trimming and shaping took an average of 40 odd hours. My bride and I had talked about this before hand and I estimated the price at about $300 dollars, but since I've run into some unforseen problems - like having to create the bias tape for the shoulder strap from scratch, because I couldn't find the exact shade I wanted in a ready made one - it seems like I should charge more than $300 but I'm hesitant about this. The dress cost about $250 and I know for a fact that she didn't want to spend too much on alterations, but she is a lovely woman and I don't want to create an issue with the payment. Granted, I did give her an estimate but on the other hand I don't want to undermine my work. By the way, she saw the dress and loved what I did so I know she appreciates the work done on it. It looks transformed, which is what she wanted in the first place. How do I handle this delicately? I'm new to the bridal business and very much rely on good word of mouth. There is a lot to talk about here. First, you probably did not foresee that this job would be upwards of 40 hours so you initial estimate of $300 was a good one. If you divide $300 by the 40 hours you are charging her only $7.50 per hour. That's not enough for any sewing professional IMHO. If a lady feels she is new to the professional and her skills not worth that of a 30 year veteran, I can see charging $10 an hour, but I would rather alteration ladies be asking for at least $20 per hour. The talent and skills need to do this type of work is worth this type of money. Maybe you did not foresee the 40 hours but you did give an estimate of $300. Legally, you can not exceed that estimate by more than 10%. I make it a policy to not give estimates like this for work that I do not know for sure how long it will take. I have been doing this for over 20 years so I can guess how long a job will take me rather well. I have a list of most frequent requested jobs, like pant hems. But, for items like this job where you are beading and the customer might also change her mind on the design making more work for you, I give a per hour estimate. Than how ever many hours it takes is what the customer is responsible for paying. She will ask for a guess of how many hours this will take you and you can give a "guess". This is not the same as an estimate which will bind you to the 10% rule. It is a good idea to give progress reports as to how many hours you have used at fittings or just a weekly phone call. Keeping her informed will save you difficulty in the end. When you are doing a job like this and a situation comes up like the bias tape thing, you need to call the customer and discuss the change in the work needed and that it will change the hours and price before you do the work. You can't add more fees at the end. That would not be professional. You can tally up the bill and inform the customer that the job did take longer than anticipated, and add 10%. In your case that's $30. When stuff like this happens you often have to call it a learning experience and gain your added value from the lesson learned. My wife has a small business making wedding dresses/gowns as well as general seamstress work (hemming, alterating, etc.) and she is perplexed and how much to charge per hour for her work. She has been sewing over 30 years and has an exceptional talent for it. I noticed in one of your posts that you charge about $30 an hour for labor. I think her skills warrant at least that amount but she feels that the $10 an hour or so that she charges may be too high. What do you suggest? She has done work that included making a gown by combining two patterns, designing a cathedral length train to include cut-out diamond shapes with chiffon covering them. All of this was just for one of the dresses that she had done. She does fittings at many stages of the process to ensure a proper fit. Is there any "rule of thumb" or guidelines that I can point to so she actually realizes what her level of skills are. P.S. I can send you pictures of some of her work if that will help. I would think 30 years of experience is worth more than $10 an hour without looking at pictures. So many women undervalue themselves. They can't stand up to a customer saying their rate is too high. Ask her to think of the types of jobs that pay $10 or less - untalented, untrained labor. Those who have gotten some training or have talent get much more. A plumber who fixes a drain, or a carpenter who fixes a table gets no less than $40 and hour. Why should someone fixing the hem of a dress get less? Jobs that require that you have knowledge always pay more. Now there are lots of other factors too, like the cost of living in your area. An Alterationist in New York can charge a lot more than I can. And there is a difference between making items from scratch and altering them. I can make much more money per hour I work doing alterations than I can dressmaking. A dress hem may take me 30 minutes to do. Charging $15 (1/2 hour times $30) is usually acceptable. Making a skirt from scratch could take me 10 hours once you figure in the time you spend talking with the customer to decide what the design will be, making or buying the pattern, acquiring the fabric, cutting, sewing, fitting, and altering (not to mention time spent on the phone). Charging $300 (10 hours times $30) plus the fabric isn't going to be very acceptable to most customers, but you might get away with $100 (10 hours times $10). This is why I usually won't accept a scratch job. Bridal alterations is as complicated as I usually get. My average for gowns has been around $200 this year. That may sound high, but brides are usually not too bothered because they understand it is hard work that requires talent and knowledge. It's not easy setting a value on yourself. Try to think of it more the value of the work, not "you" and it should become easier. I thought I'd show you the dress as my description really didn't do it justice. I think she under charges quite a bit. She charged $500 for this dress and the woman complained it was too much (even though she paid). I am hoping I can talk her into at least $18-20 an hour for making a dress. Even more if the material is hard to work with. We live about an hour South of Washington, D.C. So I really think that is a fair rate for a dress. Thank you so much for your time and your valued insight. The general public have the idea that having an item sewn should cost less than buying it. They need to be educated that "Custom Made" is EXPENSIVE. The only way sewing saves you is if you get the fabric on sale and your Granny sews it for nothing. There is no way I would have quoted less than $3000 for my work on the gown pictured. Your wife is very much undervaluing herself. It's obvious to me that she sews because she loves it and she is afraid that if she raises her prices to where they should be, than she will not get any work. She may get less work at first, but she really needs to understand that charging so little is hurting the rest of us who want and need to get more. It is reinforcing the public's idea that sewing work is low in value. There is not much you can do but try to inch her along to higher pricing. If this is the typical gown type she does, she needs to be telling brides on the first phone call that the charge for any gown STARTS at $1000, not including fabric and notions. Some people will hang up on her, BUT she will get a few who come in to talk even with the $1000 starting fee. Once she gets a few of these customers, she will slowly understand that she can get more and will start to feel like she deserves it. Thank you for this great site. I make custom bridal gowns and alterations in my home and I have been visiting your site for several years. I especially like your bustle photos. Over the years I have come up with my own solutions to bustle "problems" and I see that your photos are very much like the bustles I do. I am wondering if you charge for all of your fitting time with the bridal gowns. It's great to see how you have outlined each step. I would like to make a similar chart for my own business. Thanks so much for sharing your expertise. I don't think I need to charge for fittings. I factor it into the charge for doing the work. Do you do it differently? I just happened to visit your website with great helpful hints on sewing business. I am a full time employee not in the sewng area though. For a looog time I have been wanting to own a business & recently one of my friend's uncle who own a local well reputed sewing business, mentioned me that he wants to sell his business because of his wife's health problem. I enjoy sewing and know some basics. I repair my kids & my cloths myself but due to time limitation sometimes major once I take them to their shop & thats how I am familiar with their business. My friend's uncle is there most of the time taking care of his business and have 2 fulltime and 2 parttime workers. One of employees is well experinced & serves as a manager when ever needed. They do mainly repairing work. A well established system is in place for taking, tagging & giving orders but is manually. He is also willing to train me and whatever help needed. This business is also very close to my home. I am very interested in buying this business with a hope that I will have the same employee become a full time manager to run the show as she seems reliable and quite experinced. Is there any advice that you would want to give me on this ? It all really depends on the price he is asking for the business. Buying an established business is not usually a good deal. What you often end up owning is their headaches. Since you are familiar with the business already it's a better bet. It's still going to be a big change for the employees when you become boss. You will do at least some things differently and they might not like the changes and decide to leave. That could also be a good thing if you can hire replacements quickly because the new people will more easily adjust. The changes for the customers can be a problem too. They will expect certain things that you didn't perceive when you were helping them out before because being boss is different than just helping out now and then. As long as you know these things will happen you can be prepared for them. It sounds like this is a good situation for you to think seriously about as long as the sale price is low enough for you to make a profit working there. So often sellers want so much that the new owner is paying for years on the sale and not making any real money for themselves. Especially in bridal alteration is a process. Most brides understand that this process often takes several attempts to get it right. If a customer is being overly picky and I know she is only trying to get out of paying than I'm going to handle it differently. I will rework an alteration until the customer likes the look, but in the end if it looks good to me and she's just being belligerent, no, she is paying what I ask for for my good work. I have reworked items up to 5 times to get a bride to say it's good. I have never had anyone push me so far that I have to insist that reworking is over and payment is now due. I have a couple of questions. I am located in South Carolina and I thought you could help me with these questions. 1)Pricing services: How do you come up with a fair price. My business is in a small town and I have to compete with the drycleaner's that charge less than half of what I charge for some alterations. 2) I am wanting to buy a hemmer. What would be your recommendation? 3) I have trouble finding invisible zippers. Do you have a company that you use/know that I can order from. I have found one company that can get me some of these zippers but it takes them 2 wks to ship. In short, don't think of that drycleaner as your competition. There is no way they can offer what you can, better service, better quality workmanship. You should be different. Do not apologize for your higher pricing, just be worth it. Some folks won't use you because of it, but the ones that will value your quality will be better customers for you. 2) There's a place near Greenville that sells reconditioned machines. I can't recall the name but they are in the phone book. Try looking under sewing machines - industrial. 3) I buy all my zippers as needed from the local fabric store. It's a big pain to buy them wholesale and you never know what color or length you will be needing. I do stock up on black, navy, red and brown 9", 12" and 18" when there is a sale, but I never stash more than a dozen. I don't have space for too much stuff I'm not certain I will use. I am working on developing a home sewing business. I have been sewing for others for about 5 years. I have done it for people I have known and also as a subcontractor for someone who had been sewing for a designer. I have a problem deciding on a price to charge someone. Would you be willing to share your pricing guide? It's really hard (and borderline illegal) to compare what I charge for things to what you should charge. I don't just hand out my price list, but I will share with you what I can to help you develop your own pricing structure. There's a lot of stuff on page http://www.leanna.com/HomePro/money.html of my site to get you started. Basically, you need to decide what you need to earn and how much your skills are worth to both you and your potential customers. Right now, I basically charge $20 per hour of my time for work. Your experience level and skills may make you worth more or less than that, but I have no way to judge you. Only you can really make that call. Not even your customers can say because they want it a cheaply as possible no matter what you are really worth. Next you need to know how long it takes you to do the various sewing tasks your customers are wanting. This can be hard in the beginning when it's more or less a big guess, unless you do have some idea of how efficiently you sew. Lastly, you need to understand the market you are in, which is probably very different than mine. What are the businesses charging for this service in your town. Now, you need to know that if your talent is better than theirs, than you deserve to be paid better, but knowing your market is still valuable. I do have a price list that I have developed over the year that reflects what I think my work is worth. I am sorry but I do not share this with anyone for it is geared for my experience and would not apply to anyone else. No one likes to feel they are being used. But almost everyone likes to feel useful. There's a BIG difference there. I have a few policies that have helped me in such situations that may be useful to you. Yes, I am in business to make money, but I still want to be able to do favors for loved ones, family, friends or long time/valued customers. I have 4 levels of charging that I find comfortable for both me and my customers. 1. Full price - These are people who I do work for whom I have no relationship to. I do quality work at a reasonable price, but I do not undercut myself for any reason with this category, no matter how much they wine. I've been doing this too long to deal with it anymore. I am always polite, but I often say "no thank you" to many jobs when the warning lights go off. I don't think any long explanation is needed. In short, I rarely charge a PITA fee, I just say "no" when I feel the customer will be difficult. 2. 10% off - I call this my "PC" rate (preferred customer) This fee I use with long term, really, really good customers. The kind of person who comes back time and time again, and never complains. They deserve a reward for making my job a joy! 3. 50% off - This fee is for folks who on a regular basis, help me in my business. For example, I get a good deal of my jobs from the Talbot stores in my town. They set up appointments for me on a designated day and time each week. I meet the customer at the stores for the fitting, take the work home for sewing and return the next week to deliver finished work and meet with new customers. The Associates at the stores find this a great selling tool for them and I find it a convenience for me ( less customers coming to my home for fittings)- so I encourage the Associates to recommend my services to their clients by giving them a 50% off their personal clothing needs. As a courtesy for this generous discount, I ask Associates that they understand that I put their work after the regular customers, so if I get in a bind on any given week I know I can put off an Associate's work for the higher paying regular customer. 4. Free - Any one wants to do things for Special friends and family without having to feel like they are being used. My closest friends and family understand that I am trying to make a living with my sewing and they realize that if they ask for me to sew something they may have to wait quite awhile for it because like the 50% deal I put these jobs last. When there is time, I will do these, but I have to make money first. I never feel guilty and if anyone gets bent out of shape about it. I just see them as not a true friend. I don't often let myself feel bad when someone does try to "use" me this way. I just stick them in the 50 % or 10 % group. My most recent encounter with a "Person" happened to be a friend who asked me to help her set up a website for her business. At first I said I would because I thought it was going to be a small task the would not take much time and I had a little to give. When the project started pushing 80 hours of my time I had to recategorise it to 50% my regular hourly sewing rate ( I didn't have a computer rate at the time). She was not "Happy", but she is a true friend and has been paying me faithfully. It wasn't easy to tell her what I had to do, but I do think we are stronger friends because of it. She's still getting a "deal" at 50% so I can still feel like I'm doing a good deed without loosing my profit margin. Leanna, I went from drumming up business to being slightly overwhelmed in only a week!!! I need some suggestion about what to charge customers. I called the local drycleaners and asked what they charge to hem a pair of pants and they said $6.25 but they are a month behind. So I charged $6.00. Today, I reduced a size 36 pair of men's dress pants to a size 32 for a banquet Monday night. I am somewhat a perfectionist and it took me five hours plus I picked them up and will deliver them but only charged $12.00. What would you have charged? The lady I did them for works for the drycleaners where I had called two hours before asking for consignment work. She called me with the job so I felt I wanted to do a good, fast and inexpensive job for her so she would pass my name along but had not the heart to charge her what it probably should have cost but kind of felt it would be part of advertising if I got business from her later on. Anyway, what would you have charged for the job? It required seams down both sides and the back and taking off the waistband and reattaching it with belt loops. Just your opinion would be very much appreciated. I realize I wouldn't be able to make a living at this rate but just wanted a ballpark figure as to what to charge. You sound like a really nice person, but I think you need to realize that if your main goal in business is to give inexpensive work than you will continue to have way more work than you can handle and you won't be making enough money to support yourself. A better goal is to focus on generating a reputation that is for quality work - which I'm sure you already do, but there's a little difference. Of course you want to do a good job for every customer, but if you're going to be doing this as a business than you have to be paid what a good, quality job is worth. First off, don't even try to compare yourself to the dry cleaners. They clean things and alter on the side. They do not do anywhere near as good a job as I suspect you are capable of. You are therefore automatically worth more and should by all means charge more, not less. So your pant hem price should be at least $7, not 6. For a basic blind stitched pant hem, I charge $10 with no apologies. I do a better job than any dry cleaners. And I have all the work I want, even though my customers can go to the dry cleaners and get that done for about $6. You are just starting out and probably can't get away with charging as much as I do, for I've been doing this for many more years. But in my opinion, anyone even just starting out deserves at least $10 per hour for good quality sewing work. The pant that was a 36.- Most men's pants have a alter seam down the center back where you can let them out or take them in quite a bit. For that type of job $12 is a good price. A "Waist and seat" as it's called, should not take more than 1/2 hour. I can sometimes do one in 10 minutes depending on how the pant is configured. For 5 hours I would charge not less than $50 (my regular fee is $20 per hour, but I will often fudge it for regular customers) I take it from your tone that you might be feeling that you took longer than you should have to do it. That's OK, many things will take you longer until you get the hang of it. But I think you might have done more than you needed to if you didn't know about how to do a "waist and seat". If you do think doing a favor for a certain customer will get you advertising it's certainly OK to give them a break, but let them know what it should have cost them. You do not want a reputation for being cheep. Good quality work at a fair price is the best. The lady that worked at the dry cleaners should have had some idea of what that job was worth because the dry cleaners could not do it. One last thought. Do not let yourself feel guilty for charging a proper amount. It's the hardest thing about Sewing for profit. Charging for doing something you love to do is very hard. But your talent is worth more than you think. Don't let yourself get trapped in the thought, "I would not pay this much to have this done." Of course YOU would not because you know how to do it yourself! The proper way to view pricing is to set the price your talent is worth and then let the customer decide if her garment is worth that too. Always keep in mind that your time and talent is never to be questioned. IF a customer's view is that the garment is not worth that much than it is not your obligation to lower YOUR price to the value of the garment just so she can have the work done. You will lose some jobs because of this, but it's better than devaluating yourself. I am considering sewing professionally here in the Charlottesville, VA. area - and am not sure of my pricing. For instance, I would like to concentrate only on Flower girl dresses and adult costume. Can you give me some suggestions on how to price for my work since you have been doing this successful for a while? I would really appreciate any input. It's really not hard to come up with a price. The hard part is sticking to that price. All you have to do is decide how much you are worth per hour. When you get a proposal for an item, you have to guess how long that item will take you to do. Depending on how well you understand your own work rate this may take time to get your guessing to an accurate state, but at first it is mostly a guess. Then multiply your guess by your hourly rate and you have an estimate. The problem comes when you give this figure to your potential client and they say, "Oh that's way more than I can/will/am able to/care to (pick one) pay. Surely you can do it for less." Most beginning seamstresses cave in and lower the price. It takes a long time to develop the guts to say, "No, I am worth this amount. If you do not wish to pay that than we can not do business." You will lose customers. But if you do not stick to your pricing, you will end up working for peanuts and regretting ever taking on the job. I don't know about you, but I do not want to work for $3 an hour, but that's what most people who want sewing work done, want to pay. I was searching the web for maybe some help or advice on mending prices and found you site. Your sewing studio is great. Mine is in a sunroom. I also just finished setting it up and I really love it. I am looking for help or advice on prices to charge for mending. I would like to start a small home based business. I always mend for family and friends and I now have other people asking me for the same service. I have no idea what to charge. The jobs are not hard mostly holes in jeans, blankets, shirts etc. I would appreciate any help, advice or pointers in the right direction that you could give to me. Mending is the hardest to price for each task is different. The only advice I can offer is to take your best guess and then add a little. If you find it took less than you thought you can always give an adjustment - customers love paying less than they thought they would have to. In time you will be able to guess more accurately depending on how you work. Mending a hole in a pair of jeans may take me 30 minutes and you 20, so it's near impossible for me to tell you exactly what to charge on any single object, let alone a wide variety of them. I think the key to this is to be honest to yourself as well as the customer. Too low fees are great for her, but not honest to you. Charge enough for your time and talent to make it worth your while. If this is more than the customer wants to spend don't let your feelings get hurt or lower your rate. It's no reflection on your talent that a customer decides that saving the garment is not worth your fee. "You" are worth that price. So, charge an honest price for what you are worth, not too high or too low and let her decide if the garment is worth it. I have been sewing since I was 18 years old. Mostly for myself and for my family. Over the years friends would ask me to make something for them and I would do it, however, It has happened so often that I decided to start charging because it was taking up so much of my time. The problem is that, although I LOVE to sew, I have no education in any of this. I failed home economics in Jr. High and never took another class. I feel like I'm cheating them because I don't have any credentials or certificate of completion to show them. I've also come across the problem with friends thinking it will be cheaper for them to have me make their clothes than for them to buy their clothes at a department stores. Is there a recommended way of charging for my services?If you or your readers have any advise you can give, to help with this problem I would greatly appreciate it. In short, you need to charge what you feel you are worth, not what your friends or customers think you are worth. Sewing, like any other profession is a job and you deserve to be paid a decent amount. It's not worth it to you to work on an item for some one that takes up 6 hours of your time and get only $18. No one would take a job that pays only $3 an hour so you should not have to accept that kind of pay. With my degree and my years of experience, I will not work for less than $20 an hour and most jobs I bid at $30. You being new and having no formal training can't ask that much, but you should not undersell your talent either. As long as your workmanship is quality, I feel that even a beginner should not charge less than $10 an hour. Even a burger flipper makes this much! Now, if your sewing quality stinks, than you should be earning your money flipping burgers. Otherwise, set a decent price and stick to it. Don't let anyone talk you down. If they try simply ask how much they are paid at their job and ask if they would work for the amount they are offering. If they say, "yes", tell them to do the job themselves. This does not mean that you can't sew for a friend from time to time as a favor, but you really need to understand that working at any job is worth being paid a decent amount. That includes sewing. I rarely do custom sewing mostly because I have long ago learned that it is not worth taking on jobs that don't pay enough and only leave me stressed out. Usually I have a nice phone conversation which I explain all the things most of you have been sharing, i.e. "A couture garment is going to cost more than an off the rack one." It's pretty easy to spot the people who are calling you only because they are price shopping, even if they start off by saying they got your name from someone who highly recommends your excellent workmanship. I had a lady call just last week like this. A good friend had passed her onto me because she was booked. During the conversation she mentioned that she had actually found what she wanted on some Web site. Her answer to my obvious, "Why don't you simply buy it?" was "They wanted $6000, and that's too much". I just simply said that I doubted she would be saving much on that price with me. I was disappointed because it sounded like a project I would have loved doing. If a customer gets past me on the phone and actually gets a consultation appointment, I do the estimate on the computer. I use a spreadsheet program. It's a little tricky to do if you are not computer savvy, but it's not impossible. I use Lotus Smart Suite. Most of you probably have Microsoft Office which will also do this. First you have to find the spreadsheet part of the package of programs. In Lotus Smart Suite, it's called Lotus 1-2-3. In Office, it's called Excel. I selected the "Create a bland workbook" option. (There are also wizards that walk you through creating a spreadsheet that may work better for you if you've never done something like this before.) This gave me a screen with graphed blocks which I can use to position the formulas. Columns are lettered and rows are numbered so you can place things and create mathematical processes by typing in the letters and numbers and telling the program if you want them to be added, subtracted or any other mathematical equation you want. There is a whole list of things the program will do mathwise in the Help file. Whatever system you use to make an estimate should be convertible to a computer spreadsheet. All you need is the program, time to read the Help files to learn how to make the program configure to what you need, and a little patience to set it up. I also have a design sketch (that I can't remember where I got it from) sheet that I also recreated in another program in the computer. I print one out when the customer arrives to help her and me to visualize the design she wants so I can accurately give my spreadsheet the proper information it needs to generate the estimate. I hope this might inspire some of you to try it. Using the computer for estimates sure does take a lot of difficulty out of the client's acceptance of the resulting dollar amount. I came across your site by chance I guess..I was looking for info on bustling a few months back and found you. the info on your site was a big help, thank-you! I've skimmed through your site and your bio and was astounded at how much we have in common. I just wanted to introduce myself and say thank-you for your help and ask a question. My name is Jessica and I live in Canada, I've had a passion for designing and sewing since I can remember, I did go to college for apparel design and development, but I am mostly self taught. I believe creativity comes from within and one can only be taught how to use the tools to bring it out. I am consistently being asked to design and produce graduation gowns for girls in my home town (which has very few stores and more than once girls have shown up to grad in the same gown...ouch!). I am at aloss to know what to charge for this service....i am so flattered that they ask me i find myself not making a profit...any suggestions? Thank-you for reading this and hope to hear from you. The big problem with this situation is the small town. The girls will want one-of-a-kind dresses so they don't run into the same dress at their graduation. One-of-a-kind sewing is very expensive and for you to charge what you need to to make money the girls won't want to pay. If you were designing for a large market than the cost of each dress would be lower. Really, the only way you can make money is either charge more for each dress you create and hope your customer don't disappear because they can buy store dresses for less, or get yourself a job with a larger manufacturer where you know you are getting paid a set amount no matter what the sales are. I have been sewing for people out of my home off and on for about 10 years. I am thinking about starting again more seriously. I am having a hard time > deciding on pricing. The town where I live doesn't warrant high prices, so any suggestions you may be able to give me or where I may get info regarding this I would appreciate. I have had a commercial domain web site for 2 years now. I take credit cards and process them through my local bank. Fortunately, I had been in business with this bank for several years before I decided to accept credit cards. It took no time to get set up and I pay only 3% commission. This has worked well for me BUT I have learned the hard way the pitfalls of marketing on-line. You really have to accept credit cards to sell anything, but because you are not getting a signed invoice, the customer has all the rights in the process. I think I wrote the list the trouble I have had with customers claiming they had not received their merchandise. If you missed it - A customer can claim to his credit company that they did not get what they ordered, even if they did, and the company takes the money from YOUR account without telling you. Three days later you find out that not only are you out the money, but you have 7 days to prove delivery or you don't get your money back - no appeals, no second chances. You can be right and you still lose if you can't get the proof they want in time. Copies of e-mail don't count, phone calls don't either. If you really want to market on-line be knowledgeable before you start. Never ship anything that you can't get a signature of the customer for. Do not accept signatures from family members, friends, receptionists, etc. Your ONLY protection is the signature of the person the package is addressed to. And stay on top of every order. Keep in contact with your customer about dates of shipping and ask if they received the package as expected. Also, be very clear about your return policy - BTW, if you don't have one, make one! And if there is any way possible, get them to sign a statement that they agree to it before you send the merchandise. If they return an item to you they can still complain to their credit company and get you to give them the shipping you already paid UPS. You can be out double what you paid this way. It's incredibly annoying, but it's the way things are when accepting credit cards. On my site when you click on the link to order something, you first get my return statement and at the end is a link that says, "I accept these terms and want to go on to the order form". I have been told by VISA/MasterCard people that that does not protect me enough. They say that I can't prove that the customer read and understood my statement, they can just skim the page to get to the link and order without really reading it at all. Most people who order don't know these things, but you should so you won't be caught unprepared when you get one of those customers who know how to use the system against you. Yes, with UPS you have an option to get no signature, any signature, or only the signature of the person named on the label. It costs extra to get the Name only type, but it's worth it. If you missed the original stories and are curious about why I'm so bothered by this, go to: http://www.leanna.com/HomePro/legal.html#Headaches I posted them there. When you set up a Merchant account you have to have an account for them to make deposits into, but you don't realize that you are giving them access to that account to take money anytime there is a complaint. I have found that I can keep a separate account for just my Merchant deposits and keep that account low in funds so that when they go there to take any money it's not there and they have to contact me about the complaint. You can't stop this process, but you can make sure you have the proof they ask for. It's a pain, but I've pretty much decided to stop selling the high ticket items soon. I have been selling other smaller priced things so that when I loose a sale this way it's only $7, not $600. Until the rules change, and we have more rights as Merchants, we have to be creative to protect ourselves. It takes awhile. And there are no easy answers to your question. You never really stop spending money on the business part of things. There's always some new gadget to get or some neat thing you just gotta have. I tend to think of these things too as part of "paying myself". They are treats I give myself to make my work easier in some way. Since my work is also my pleasure it's neat because I get to write off these items in my business taxes, even though they are treats to me. When investigating the area I am moving to the cost of living is a little lower than where I am currently. Should I change my pricing structure to accommodate this or leave it alone? I enjoy your web page and look forward to hearing from you concerning my question. This is a toughie. Generally, I think I would lower them just a tad. It depends though. If I saw your list, I may think your prices too low right now and advise you to raise them even with the cost of living change. That's usually what I find is that most ladies underprice themselves. Try on some clothes at one of the "Nicer" department stores and ask about their alteration fees. Don't ask at the Dry Cleaners, they will be cheep. If there are any alteration businesses in the phone book call for an estimate on some garment in your closet. This will give you something to compare yourself to. When sewing something like a historical costumes, is this priced differently that normal sewing? Not really, but I haven't done much. I do charge for research at a lower rate than the sewing. Hopefully the customer will do most of the research for you, but there is a good amount that you just have to do yourself- construction techniques, etc. A full fledge outfit can get quite pricey though. 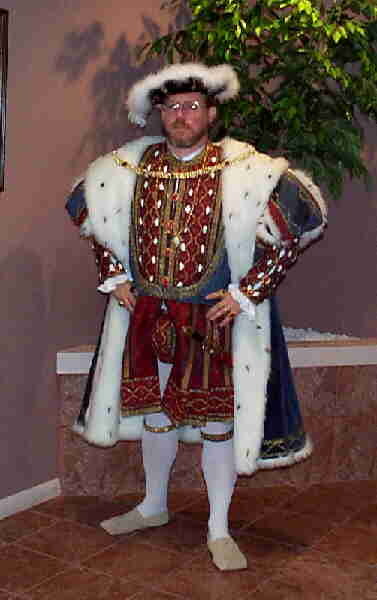 My Henry VIII took about 300 hours which includes 3 afternoons in a library doing research. I spent about $700 on materials too. So at my normal $20 per hour rate the price would be close to $7000. I probably would do it for around $6000 if I took into consideration the research but I didn't keep real good track since I was making it for my husband not a customer. Finding a customer willing to pay that much is not easy, so I don't do much of this. There are many who want it but I'm not about to work for near nothing. Other question, is there anyone out there doing costumes? fantasy for preference but possibly period? . . . a fascinating and possibly lucrative specialty. Fascinating, definitely. Lucrative, not. Sewing costumes for conventioneers is fun and a little profitable, but not a profession you can make any "real" money in. I do cloaks and capes for a few Sci-fi/Fantasy Cons and it does little more than pay my way to the convention. After you've paid your booth fee, electrical fee, vehicle rental and parking fees, hotel and food expenses, and figure in your raw materials costs you are lucky if you come out with enough to say you rated $10 an hour for all the time you put in both making the items for sale and working at the show. Many people don't take all this into account when figuring their profits, but when you do it doesn't add up to as much as one would hope. Example: The biggest show I do is GenCon (if you are familiar with the various cons) at Milwaukee in August. I just sent in my booth fee today, $1980.00 for a 10' X 20' space (which I share 1/2 with a friend that does neat jewelry- so I'm really paying $990) . I will pay approx.. $1000.00 on fabric, another $400 on excessories to sell, $100 on electricity fees, $115 per night hotel (5 to 6 nights), $9 a day parking, about $40 a day for food. (This year I don't have to rent a van, I bought one. That would normally add another $350.) That comes to about $3350. I will work about 6 hours setup day, 9 hours for each of 4 show days, and about 4 hours for tear down. During the summer I will spend about 60 hours sewing 100 capes and about 120 hours sewing 100 cloaks. That's 226 hours. Last year I sold $4467 at the show. So this year I could do around $6000 if I'm lucky and picked a good space on the Dealer floor. $6000-$3350= $2650 $2650/ 226 hours=$11.72 per hour of my work. If I'm not so lucky I should still make close to $5000 which translates to $7.30 per hour. Not a very lucrative occupation, but it is not without merit. So why do I do this when I normally make $20 for an hour of alteration work? If I simply attended the same convention, I would be paying much of the same costs, minus the booth and raw materials, so I figure that if I make any money I'm still ahead because I could not afford to pay to go to this show. All in all, sewing costumes for convention isn't going to make you rich. But doing shows is a lot of fun and you get to meet the most interesting people----like me. Leah's Notions - "What Are You Worth?" I'm almost recovered from the Original Sewing and Craft Expo and Beyond Pin Money. It was a great week filled with exceptional speakers and lots of good networking opportunities. But I must say that the most asked question I heard was, "What price do you charge for your work?" I've also seen this asked over and over again on the Internet groups I visit. It's a hard question to answer because what I charge is not necessarily the price you should charge. The most given answer I hear is that pricing can't easily be compared because of cost of living factors in different locations. But there is another factor that I rarely hear given. My instinctive answer to, "What should I charge for my work? ", is, "What are you worth?" When I first started sewing for others I was working in a fabric store and didn't need much money so I charged about $5 an hour. I thought that was plenty at the time. It really wasn't, but it was what I thought I was worth with no experience. Once I decided to go full time I needed to reevaluate my pricing and raised the base to $10 an hour. I soon found out that it wasn't enough to cover my overhead and give me a decent salary. Soon I had 4 employees to care for along with the other costs of running a store. The rate climbed to $20 an hour. Charging this amount was hard for I felt it high, but I had gained several years of experience and was really worth it. Anyone just starting out in a sewing business really can't simply charge what other sewing professionals are charging. Asking for others pricing structures is the easy way to set your pricing, but it's not the proper way. These people you are asking probably have many years on you and most likely are much better skilled than you are. It's not the politically correct thing to say, but they are worth more than you. So for you to charge the same thing would hurt the reputation of all the sewing professionals in your area. This is why I don't support the overall sharing of price lists between sewing businesses. So, what should you charge for your work? It's a personal decision no one can make for you. Honestly look at your skills, education, and experience and determine an hourly rate that reflects these factors. At first you'll have to guess at how long it will take you to do the sewing tasks you will be taking on, but if you keep good records of your jobs accomplished, you will start to see your own pattern of work and be better able to apply your hourly rate to jobs. It may be difficult to evaluate you own skills but you will be better off in the long run charging what you know is the right price for you. While working on my tax return I decided that I was not comfortable with the amount of debt my business was in and the exorbitant interest I paid last year. I do hope to be paying most of this debt off after my August convention, but until then I have to continue paying this interest rate that is taking up too much of my profit. I also had a dispute with them when it came time to order the fabric for this important convention and found that their cash advance policy had changed and I could not get the funds I was able to get last year. Thinking on what I should do I discovered that my bank was having a special on new Visa/MC card accounts: 6.9% interest for the first 6 months, online banking, a lower regular APR than I was paying on my account, and no restrictive cash advance rules. It seemed like the perfect answer. I would get a break in the interest for just the amount of time I needed until my convention, and then I could pay off the new account and make some better choices in the future. So, I applied with a request for balance transfer and closing of my old account and the same credit limit. When my new account came in though it was about $5,000 lower than I requested because of the high balance on my old account. I called to request a higher credit limit to find out that they don't consider such increases until the account is 6 months old. I didn't feel like they were understanding that I intended to close this old account and therefore did not want to give me the credit I needed to work my plan. So, I made up a folder of my financial history (tax returns, credit card statements, etc. ), went to my bank and requested some advice and help. I explained what I was trying to accomplish and the Manager tried to explain to the credit department, but got the same response I did. She suggested I try a regular business line of credit. A business credit manager came over and examined the information I brought and broke the unsurprising news that this wasn't an option for me. He suggest a home equity loan, but I didn't feel it right to have my husband cosigning for my business stuff. I've worked too long to have a credit history (as week as it may be) for my business standing on it's own to consider this option. I left the bank rather discouraged. At home I checked my e-mail to find an enchain letter. "Gee, just what I need today! ", I thought. But it didn't entail sending any money, recipes, or underwear. You just had to send it to as many people as you knew within 1 hour of receiving. It couldn't hurt, so I sent it to about 20 people on my e-mail list, and I went out to check my snail mail. You know those "pre approved" credit card things that are really a credit application? Well, I got one, but I could tell there was an actual card in the envelope. So instead of chucking it as usual, I opened it to find a gold card! I called to ask what the credit amount was. I nearly fell over as they told me it was three times the amount I was trying to get my bank to give me. And it had the same 6 month deal. Great! I could get the break I was hoping for, close my other account, and I'd gain the clout of having a gold card. In August I can pay it off and decide if I want to keep it or use the account my bank gave me, which I could then request a better limit for. That's about as creative as when I borrowed $3,000 from my Dad to start my business 11 years ago. He forgave me the balance after I had paid off only $1,000. In a recent job I was asked to sew sequins and beads onto a store bought leotard and short blouse to be used in a Latin Dancing Contest. It also needed to be done in one week. I gave my customer an estimate of 10 hours work. When my actual time passed 12 hours without being half way done, I started getting nervous. I absolutely hate botching up an estimate. I thought about lying about the hours so I would not be charging her so much more than the estimate, but then realized that she would expect a quick job each time I worked for her. So when I ran out of one type of bead I decided to call her to let her know I was going to get more, and to casually mention that I was greatly exceeding my estimate. She didn't seem shocked and okayed the extra beads. When she came for the final fitting (I had to adjust a few hooks after the beading was done) she was very pleased with the work. Then it came time to tally up and I told her I felt that since I had mis-estimated so badly (it ended up being 24 hours!) I would split the overage with her this time and promise to estimate better next time. She surprised me by insisting to pay the actual hours' amount. I tried to not look shocked and let her. Yesterday we had to have some serious work done by Roto Rooter. They charged us $150 an hour to blow water through our pipes! Now why couldn't I accomplish the same thing with my garden hose for free? Ya, I know it was a bit more complicated than that, but it seemed so expensive to me. I understand how customers feel because I am one at times and I do feel overcharged too. Usually it is true that you do get what you pay for, and quality is expensive. When you call a pro, you need to expect a pro price. I do for plumbing pro work so I need to learn to not fudge when some one calls on me as a sewing pro. I really don't know where to start and need some idea's on prices to set for different types of sewing. Could you help me with some of the different places I need to go to get this information or could you provide me with your price list on different sewing prices that you do? Pricing is very hard to share since the cost of living for your area is much higher then mine. Here's a book I think will give you a starting place. It took me a few years to develop a pricing structure that fit how I do my work. Some things you may be able to do faster than I could, and some I could do faster. It takes time to find your level and price accordingly. Start with a list and keep track of the tasks you do and how long they take. After about a year you will be able to fine tune the list well enough so that you can charge according to how you perform. I have a small sewing business in my home. I have been in business for 4 years. This past few months I have begun to question the wisdom of continuing the clothing construction portion of my business. It seems impossible to accurately estimate the amount of time it will take to complete a garment. Although I am able to charge for all the hours involved, scheduling my work effectively is impossible! These scheduling problems do not arise when doing alterations. The same questions I wrangle with myself! Alterations always make more money per time spent working. It's just so much easier to judge your time than construction because you just can't predict what the customer is going to do during the project. She may dislike anything along the way and cause you no end of headaches. Because of this I rarely do construction anymore. I will as gifts or for my family, but it's just not worth my time to charge someone. It usually ends up to be $2 an hour after the whole thing is over, and who wants to work for that? A girlfriend and I are discussing starting a home based embroidery business. We've talked about credit cards. Does your home based business take them, What bank do you use, etc.? Yes, mine does, and it's really easy to get an account. Just go to the bank you have your checking account with and ask to apply for a Merchant Credit Card Account. Depending on your annual sales, you will get a percentage rate for the account. Mine worked out to be 3%. I also have a $15 per month charge if I do no charge sales that month. If I do sales it applies to the $15 until the 3% generates more. Your bank may have other options for you, like I rent the box that does the transactions. It costs nothing to ask and you don't have to be big in sales to get an account. When I started working for myself, one of the first things I had to adjust to was making decisions based on money alone. Somehow it all seemed so greedy. When you love what you do, the rewards are intangible but quite fulfilling. It was hard for me to shift my satisfaction with the intangibles to a realization that money is what keeps you in business so you can receive those non-monetary rewards. I had to tell myself that it wasn't a sin to make a profit. I've been struggling with business decisions for 10 years now and it hasn't gotten any easier. I've often wished I had majored in Business Management instead of Home Economics in college. My husband thinks I'm afraid of taking risks. I think it's more than that. It always seems that just when I'm happy with the way my business is going, something comes up to change it. Change is a funny thing. It can be exciting or catastrophic or something in-between. We may anticipate the world coming to an end only to wake up the next day to find that we actually like it better this way. I've always considered myself to be an optimistic, flexible type. But lately, changes have been hitting me below the belt. On the other side, change is what I like most about my business. I do alterations because it's always something different. I sew the faux fur coats because it gives me a break from alterations. I go on conventions for a change of scenery. And all this variety helps me fight boredom. The difference is the changes I choose and those that are inflicted on me. And usually, the inflicted type concerns some kind of money decision. That takes me back to where I started. I suppose all this is designed to help me to grow into a better person. Or, maybe God is not a woman after all! I've never really paid much attention to what other people were charging for the same services I do in alterations or dressmaking. I developed my pricing structure solely on how much time it takes me to do any certain task. There are so many variables between sewing professionals (talents, style, education, rnachinery, gadgetry, and overhead expenses of workplace or employees) that it makes pricing comparisons very difficult. I do keep a list of the operations I perform on a regular basis and set prices for each. Some of the prices are ranges and others are itemized according to variables like linings and topstitchings. I keep it as simple as possible so the average non sewing person, i.e. the clerks at the stores I service, can figure a reasonable estimate of what a customer is thinking of having me do. Then I update my list yearly taking into account which tasks I'm asked to do most often and where my abilities have gotten better. As I learn how to do certain things more efficiently, I lower the price. Where other items have gotten more complex, the price goes up. Some listings that I haven't done in some time get dropped while new items are added as the focus of my business changes. Then, I do a modest rise in price across the whole list no matter what the difficulty level or time constraints because I've gotten more experienced and everyone deserves a raise now and then. What you charge for your talents is a very individual thing. The only criteria you really need is your own sense of satisfaction. Honestly ask yourself if you are making what you are truly worth. Are you just starting out wit little training or experience, or do you have a long list of degrees and satisfied customers? The best advise I can offer is make a list to start with and then revise it as you evaluate yourself. It takes some time to figure out where your talents match what the market will bear. You'll do some work underpaid, but after a while you'll find your niche in the sewing market and the money will work itself out. I absolutely love to sew but have always resisted doing it for a living as I don't want to turn my greatest love into a chore. Maybe I am wrong about this but I am so busy sewing for the family I have no time for anything else. I understand. It is hard to make that change from sewing for love and sewing for a business. But I don't think you have to give up the love to make money. Just think of all the thousands of lucky soles out there who are working in jobs they do truly love! Isn't that what we are all trying to accomplish? You are also right about sewing for family. That may have to slow down if you go into business. But then again, you do not have to give it up. It just depends on how much money you "have" to make in your job. If you do need this income for living, then you will not have much time or energy for family sewing. The best scenario is that you do not "have" to make money sewing and can therefore plan your time as you please between family and client sewing. But the joy of being able to stay at home when you have small kids, and have a rewarding carrier, is beyond description. Last week, there was this beautiful day and my son went across the street to play in the neighbor's driveway with a bunch of his friends. I decided that it was silly for me to be sitting in my basement sewing when I could be on my porch sewing and enjoying the day and watching my son play. I set up a couple of tables and sewed out there all afternoon. My son kept coming across to say, "Watch me Mommy"--- and I could without feeling guilty about getting behind on my work or missing the best years of his life. No other job could give me this! I HAVE RETURNED TO YOUR SITE TIME AND TIME AGAIN FOR TIPS AND TRICKS JUST FOR GENERAL KNOWLEDGE. I AM SOMEWHAT SELF-TAUGHT. MY GREAT-GRANDMOTHER AS WELL AS MY GRANDMOTHER AND MOTHER SEWED THEIR OWN CLOTHES, AND CLOTHES FOR ME, SO I WAS EXPOSED AT AN EARLY AGE. I'VE BEEN SEWING SINCE I WAS TWELVE. BRIDAL, COSTUME AND HISTORICAL SEWING IS MY PASSION, AND I AM SO IMPRESSED WITH YOUR SKILL. I ENJOY LOOKING AT ALL THE PHOTOS ON YOUR SITE, AND RETURN OFTEN LOOKING FOR MORE INSPIRATION AND EDUCATION. RIGHT NOW I'M TRYING DESPERATELY TO LEARN HOW TO MAKE MY OWN PATTERNS. I'VE ALWAYS USED COMMERCIAL PATTERNS AND ALTERED THEM TO MAKE MY OWN CREATIONS, BUT I ALSO DRAW AND HAVE A COLLECTION OF DESIGNS THAT I WOULD LOVE TO CREATE PATTERNS FOR AND EVENTUALLY MAKE. I WANT TO CREATE MY OWN DESIGNS WITHOUT HAVING TO RELY ON COMMERCIAL PATTERNS. MY LIFELONG DREAM IS TO SEW PROFESSIONALLY. I KEEP MAKING "SAMPLES", AND HAVE GOWNS TAKING UP SPACE IN MY HOME. THIS HAS BEEN GOING ON FOR MORE THAN 20 YEARS! I FEEL VERY INTIMIDATED ABOUT SEWING FOR THE PUBLIC BECAUSE I HAVE BEEN IN PUBLIC SERVICE FOR MOST OF MY LIFE, ONCE WORKED IN A BRIDAL SALON, AND KNOW HOW PARTICULAR CLIENTS CAN BE. I'M ALSO WORRIED ABOUT EXPERIENCE. I'VE DONE A LOT OF SEWING ON MY OWN, BUT NOT MUCH FOR OTHER PEOPLE. I'VE FOUND THAT MOST PEOPLE WHO'VE ASKED ME TO SEW FOR THEM DO SO THINKING THEY CAN GET SOMETHING MADE MORE CHEAPLY. BUT SOMEONE ONCE MADE ME REALIZE THAT CUSTOMIZED WORK SHOULD ACTUALLY COST MORE. I SUPPOSE THE BEST WAY FOR ME TO GET STARTED IS BY DOING SMALL JOBS FOR PEOPLE I KNOW. I'D REALLY APPRECIATE ANY ADVICE YOU CAN GIVE. Yes, it is quite a problem when most folks think having something sewn should cost less than buying it. That is why I do mostly alterations. When someone calls me for custom sewing I tell them it's $30.00 and hour and I do not give estimates. If they can't live with that than I do not sew for them. I used to waste a lot of time with folks developing the design and getting the fabric and labor cost only to have them say, "I can buy it for less than that". So, I'd have to either lower my price or let them go. I've decided that that is just too much waste of my time. So when someone calls I tell them I do mainly alterations and if they want a custom job it's $30 and hour for however long it takes. I do not let them argue and waste my time. I make a good living doing alterations. I have not taken on a custom sewing job in many years. It's great that you have a passion, but if you can not get a formal designing degree no one will hire you. If you are wishing to start your own designing business it's a long hard road. Finding the people who will pay the prices you need to get to have a thriving business is very hard. Many years ago when custom sewn garments were special it was easier, but not today when cheep clothing from over seas is everywhere. You have to educate your clients that custom made is expensive and many of them will not want to listen. I decided that it was too much trouble and have designed my business to do mostly alterations and I do make a good living that way. I hate to sound discouraging, but I do wish to tell you the way things are. When I first started sewing as a business, it was really hard for me to put a price on my work. I had to realize that if I could not make a profit in my business than I would not be abel to do what I love as a business. Sadly to say, I found out that custom sewing garments from scratch just doesn't make you any profits. I did find that I could make money doing alterations. So I do that for money and I keep my custom sewing creativity for family and friends where making money doesn't matter.